I have always been a neat freak. I knew that I preferred to live in a tidy space, but it wasn't until after my divorce a couple of years ago that I have learned that, for me, less is more. When I moved into my cute little 1962 ranch house in 2011, I brought only a few pieces of furniture from my old dwelling: a chest of drawers my step-mother had given me that I had refinished myself, my hope chest from my high school graduation, a handmade bookshelf from my parents, and my beloved elfa shelving and desk for my home office. I knew that these core pieces would serve me well for storage. I also brought with me my beautiful antique radio and my favorite pieces of art. From there, I decided to be very particular about the rest of the things that came to live in my home. Practicing what I preach to my organizing clients, anything I bought or was given had to fit well in the space and be either something I used or loved. I also made it a point to buy very little brand new items. For one thing, I have a taste for mid-century modern furniture like the kind you might see on the set of "Mad Men". This stream-lined style fits well with my desire to minimize visual clutter. Also, I love the idea of giving a second or third life to things. So, besides new linens and some kitchenware, most everything else came from consignment and antique stores at a fraction of the cost of buying retail. And I continue to be vigilant about minimizing how much stuff comes into my life and my home. I do this because I have a strong sense of calm when I am surrounded only by what I need, use, and love. And as an added benefit, this more simple and practical lifestyle has allowed me to save tons of money. Before I add a thing, I think about where it will live in my home. If there is no room for an item without cluttering or cramping the space, I will often get rid of something else either by reselling, donating, or trashing it. 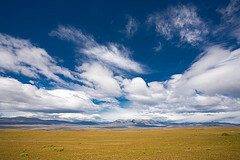 Through this life of voluntary simplicity, I have come to value the zen calm that flat, open spaces bring. I appreciate the flow of energy and creativity that is allowed to occur when my closets, drawers, countertops, and shelves aren't filled to capacity. I have also found that I am more grateful for what I do have. By purposefully minimizing my possessions, I believe I have left room to attract more positives into my life. And the good just keeps pouring in. Copyright (c) 2008 Suellen Germani. All Rights Reserved. Suellen Germani the founder of Creative Order, a professional organizing firm dedicated to teaching busy, creative people how to be better organized at home,at work, and at play. To schedule a Creative Order organizer for one-on-one organizing assistance or as a speaker for your organization or association, go to www.creativeorder.com or call (404) 271-2111. We all know that one of the best ways we can protect ourselves from identity theft is to use a shredder for much of the personal mail that comes into our homes. But what types of things need to go into the shredder and what can go straight into the trash? 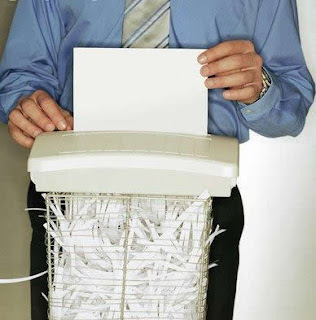 Here are some of the things I recommend that you shred either in a home shredder or in an industrial shredder such as those found in corporate settings or those available at free community shredding events such as the ones I mention at the end of this list. On April 16 from 10 a.m. - 1:00 p.m., the Community School and Eagle Secure Shredding will be having a community shred day in the parking lot of the First Baptist Church of Decatur located at 308 Clairmont Avenue. A $5 donation per box (maximum of 10 boxes per patron, please) is welcomed and all proceeds go to the Community School, a school for junior and high school students with Autism Spectrum Disorders. You can find more information on this event at www.thecommunityschool.net. There will also be a community shred day on Saturday, April 30 from 9:00 a.m. until 12:00 p.m. in the Resurgens Bank parking lot (2300 Henderson Mill Road, Atlanta, GA 30345). This event will be sponsored by the Northlake Community Alliance, Inc. , Resurgens Bank, and Eagle Secure Shredding. The event is free but there is a request for (tax-exempt) donations to support the work of Northlake Community Alliance. There is a limit of 5 copy-paper sized boxes or equivalent bags. 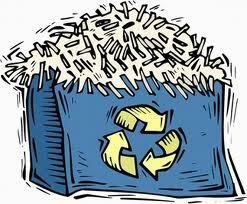 Arrangements can be made for large shred jobs by contacting Ian Taylor at Eagle Secure Shredding at (770) 619-5300. For more information go to www.resurgensbank.com. If you would prefer to do your shredding at home, I recommend that you invest in the best cross-cut or diamond-cut shredder that you can afford. Don't waste your money on the cheaper strip-cut shredders as their shredding can be put back together by identity thieves and the cheaper machines wear out really quickly. For those of you in the Atlanta area, it's time for the City of Decatur's bi-annual Electronics Recycling day. Bring your old cell phones, cameras, PC components and other outdated and unused electronic equipment to the Decatur High School parking lot from 9:00 a.m. - 1:00 p.m. on Saturday, March 19th. The lot for drop-offs is located at the corner of N. McDonough Street and W. Howard Avenue. Electronics dropped off will be sorted and broken down into raw materials and sent to recyclers for reuse. In addition to electronics, you may drop off batteries of any type, Styrofoam peanuts, clean Styrofoam blocks free of foreign objects, mercury thermometers and thermostats. Televisions may also be recycled for a $10 cash-only fee per TV with exact change. There is no charge to recycle other items. Recyclables must be dropped off between 9 a.m. - 1:00 on Saturday. Early drop-offs are not possible. Almost anything with an electrical cord can by recycled except microwave ovens. For more information including a full list of recyclables allowed and last-minute updates, visit www.decaturga.com/electronicsrecycling. I take advantage of this recycling opportunity often and can attest to the fact that it's a very well run event. You'll be in and out in no time! 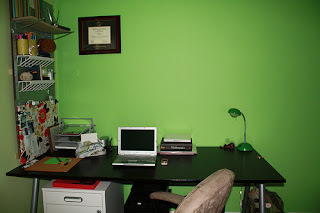 There is an interesting phenomenon that occurs with my organizing clients when I take "before" photos of their space. When we look at the photos of the cluttered spaces they live in day-to-day, they are often shocked by just how cluttered the space appears. It's as though they have become desensitized to this visual clutter and no longer notice it. But a photograph offers them an "outsider's view" of the space and helps the client acknowledge the real scope of the project. Some people have a very high tolerance for visual clutter and are quite comfortable living and working in spaces in which all flat spaces are covered with stuff. With these clients, I tend to focus more on the functionality of the space rather than the way a space looks (not that you can't do both, but the emphasis on appearance is minimized). Other folks have a very low tolerance for visual clutter and become anxious and unfocused trying to function in a busy-looking, cluttered space. With these clients, I focus more on storage solutions than I may with the clutter-tolerant people. The real challenge is when a clutter-tolerant person lives with a clutter-intolerant person. In those situations, I work with both people to create compromises so that they can both be more comfortable and functional in their space. If you are clutter-intolerant and you're living with a clutter-tolerant person, consider taking photos of the space of concern. Then try having a calm, constructive conversation with the clutter-tolerant person where you show them the photos and explain how the clutter affects you. Seeing the clutter from the outsider's perspective offered by a photo may help them see things with new eyes prompting positive change. Join me this Saturday morning, February 26th at 9:30 a.m. as I wrap up the Finders Keepers free "Get Organized" lecture series. This two month series has featured several members of the National Association of Professional Organizers, Georgia Chapter. Saturday's presentation entitled "Making Room for Purpose and Passion" covers ways to make room, literally and figuratively, for more fun, creativity, purpose and passion in your life. We will discuss everything from cutting clutter to dumping toxic relationships to reclaiming what YOU want more of in your space and in your day-to-day life. This workshop will begin at 9:30 a.m. sharp (we organizers like to respect your time) at Finders Keepers Furnishings. Seats are first come, first serve, and there is also plenty of standing room available for overflow. When I spoke in January we had a standing-room-only crowd! When you walk into your home after a hard day's work, do you breathe a sigh of relief as you settle into your cozy space, or do you cringe at the clutter that faces you on the other side of your front door? For many of us, clutter is more than just a nuisance. Instead, it is a problem that can rob us of our sense of calm and well being. Your home should be your sanctuary, the place where you come to relax and restore your spirit. If you feel stress in your home because of chaos and clutter, one of the healthiest things you can do for yourself is to reign in this clutter, reclaim your space, and embrace a sense of calm. The first step is to pick one room that you will deem your sanctuary. This may be your bedroom, your study, a man-cave in the basement, or a nook for an artist's studio. Once the space is decided upon, take a box or clothes hamper and remove everything from the space that needs to live elsewhere in the house. Then take a look at what is left and decide whether you REALLY need to keep everything or if maybe some of the items have outlived their welcome. Assign homes to the items that are left and put them away. Once you have only the essentials in the room, it is easier to organize what's left in a way that is visually pleasing either with shelves, boxes, bins or cabinets. Finally, make sure that you monitor the upkeep of this sacred sanctuary space so that you have at least one place in your home where you can regularly retreat to relax, read, meditate or whatever else helps you unwind and recharge your battery. Now that the holidays are behind us, you may have noticed that you are receiving new catalogs in the mail simply because of your recent holiday shopping patterns. There's a way to opt out of receiving most of these catalogs without having to contact each individual retailer. Catalog Choice is a free service that offers opt-out requests for individual companies from one web site. I used this service when they first came on the scene in 2007 and have noticed a drastic reduction in the number of catalogs landing in my mailbox. The are also now offering a premium service where, for an annual $20 donation, they will communicate opt-outs to the third-party marketing companies that trade your name and personal information based on your buying history and behavioral characteristics. This stops more mail at the source and enhances your privacy protection. You may sign up for up to four name and address combinations that you want Catalog Choice to submit for unlisting. Save trees, stop catalogs from cluttering up your home, and protect your privacy by signing up at www.catalogchoice.org. For those Better Organized readers who live in the Atlanta area, there is a free shredding event scheduled for Saturday, January 22 from 9:00 a.m. - 12:00 p.m. at the Toco Hill Shopping Center. The event is co-sponsored by real estate agents Joan Kaplan and Tammy Martin along with professional organizers Michelle Cooper and Linda Lanier (who you may recognize as one of Creative Order's Lead Organizers). Look for the Eco Shredding truck near the clock tower by Kroger. To guarantee that your sensitive documents are definitely gone for good, you will be able to watch your papers being shred. Even better, there's no limit to how much paper you can bring! If you've got a bunch of shredding that you've been stockpiling, save your poor little office shredder and bring your papers to the Shred Fest. This Shred Fest is being held in conjunction with the National Association of Professional Organizers' Get Organized Month which occurs each January. Declutter and make room in your file cabinet for your more current and active files. This is the perfect opportunity to get rid of those boxes of old papers that have been piled up in your home or office! For more information about this event, you can reach Michelle Cooper at 404.784.2100 / michelle@put-it-there.com or Linda Lanier at 404.435.8425 / linda@put-it-there.com. Every second Monday in January is "Clean Off Your Desk Day" and what a great way to start off the new year! Here in Atlanta, we're buried under about five inches of snow today making this the perfect time for my local organizing clients to tackle their desks at homes. Gather your supplies: big trash bag or garbage can, a small box or container for the paper to be shredded, another box or laundry hamper for those items that need to be moved elsewhere in the house or office, hanging or manila file folders, depending on how you prefer to manage your files, and a label maker. Start with a bird's eye view of your office and quickly grab anything that isn't supposed to live on your desk or in your office. Put these items into a "MOVE" hamper/box. Notice whether there are any other extraneous items on the top of your desk. This includes framed photos, freebies from trade shows, excessive quantities of Post-It notes, etc. These items need to be off your desk and placed elsewhere in your home or office. The only thing on your desk top should be items and files that you use often. If you don't have a supply drawer, create a makeshift one using a drawer organizer insert that sits on top of your desk. Or you can use the upturned top of a decorative organizing box to house commonly used office supplies, which is what I do. The supplies I use less often live in the bottom drawer of a rolling file holder that sits next to my desk under my printer shelf. Now combine all of your paper into one pile. Start with the top piece of paper and work your way down. 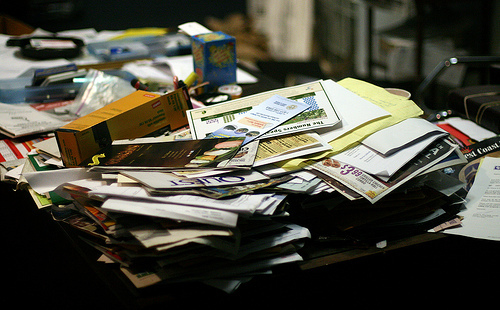 For each piece of paper on your desk, decide whether to Keep, Shred, Throw Away, or Delegate. If you are keeping it, add it either to your FILE pile if it's reference material or to your ACTION pile if there is an action that you need to follow up and do related to that piece of paper. Remember to put paper that can be delegated into the DELEGATE pile with the person's name who you're delegating to on the top of the page or on a Post-It note. If the paper is home-related, feel free to delegate it to appropriate family members. After you get through your paper pile, if you have the energy and brainpower left to continue, file the paper in your FILE pile creating either manila or hanging files for your file cabinet or desktop holder. If you don't have a file cabinet, a plastic file box with ridges for hanging files will suffice. These are often on sale at your office supply store during tax season. THEN, if your brain has not yet exploded, decide how you want to handle your ACTION pile. Prioritize the action items by how critical they are and when their deadlines hit. Many people find a tickler/reminder system such as the 43 Files system that David Allen writes about in "Getting Things Done" which is the one that I prefer. Finally, deliver all of the items in your MOVE hamper to their appropriate rooms in the house or office. If all of this is too much for you to take on in one day, go ahead and make this your "Clean Off Your Desk WEEK" and break it down into smaller steps. Then enjoy the peace of mind that comes with a clean desk! For those of you who live in the metro-Atlanta area, the City of Decatur is hosting its bi-annual electronics recycling day on Saturday, October 30 from 9:00 a.m. - 1:00 p.m. at the Decatur High School parking lot at the corner of N. McDonough Street and Howard Avenue. The event is open to anyone, not just residents of Decatur. Bring in your old cell phones, cameras, PCs, printers, stereos, DVD players, and other electronics instead of sending them into the landfills where they may leak mercury and lead. You can even bring in televisions for a nominal fee of $10. All electronics dropped off will be sorted and disassembled into raw materials or cleaned for re-use. Batteries of any type may also be dropped off. Almost anything with an electrical cord can be recycled at the event EXCEPT microwave ovens, furniture, light fixtures, large household appliances, lamps, or vacuum cleaners. For additional information about the event, please call Sean Woodson at 678-898-8562. Very often my organizing clients are entrepreneur moms who complain that they barely have enough time to grow their businesses, much less keep up with all the household chores. Sound familiar? When I hear this cry for help, I ask the mom how old her children are. If the children are over 3 years old, we discuss ways that the kids can begin helping with the household chores. Like most projects, the secret to success first lies in proper preparation. So plan ahead and pick a day when all family members can pitch in. Gather supplies together, including snacks and drinks. Then encourage the kids to pick out their favorite up-tempo music for the occasion. Also remember that teenagers are often eager to make a little spending money. You may consider hiring them to help with basic household management tasks such as filing and entering info into accounting packages such as Quickbooks. Delegating chores teaches the kids valuable home and life management skills while reducing your personal workload and stress. And after the hard work is done, reward your helpers by going out to a favorite restaurant, ordering take-out, or renting a couple of movies that the whole family will enjoy. For almost twenty years, my husband and I have lived in a cute little 1950s ranch house, and our lack of closet space has forced me to practice what I preach as a professional organizer. One thing that has worked for me is to keep my off-season clothing in the attic. Each spring when the temperatures rise and the flowers start to bloom, I haul down three or four plastic bins of cute summer dresses, skirts and shorts. I love pulling out what feels like a whole new wardrobe after not seeing it for six months. Part of this ritual also includes me trying on most of the "new" spring/summer clothes to see which pieces will continue to earn the right to live in the prime real estate of my little closets. To make the grade, a piece has to fit well, be comfortable, and make me feel pretty. As I go through this process, if I realize that I need a garment or accessory to complete an ensemble, I add the missing item to a "To Buy" list on my iPhone. This habit helps me to better remember what I need when I am out shopping. As I put away last season's clothes, I also determine what to do with those pieces that I didn't wear the past season. I ask myself why I haven't worn the piece (was it scratchy, too tight, too loose, unflattering, out of style? ), and then decide if I still like the item enough to lug it back into the attic again until next season. Some of my organizing clients have the luxury of having lots of closet space and may find it easier to store off-season clothing in the closet of a spare bedroom. And still others keep all of their clothes in one central closet year round but keep off-season clothing on the far ends of the closet with in-season clothing in the middle allowing for easier access to their "active" wardrobe. Though it is a time-consuming process to re-evaluate the inventory in your closet each season, it's worth the effort because of the time and anxiety it saves you. Imagine opening the closet and knowing that everything fits and is wearable. 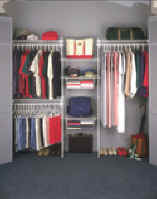 Even better, when your clothes aren't crammed into a tight space, they will look and last longer. If a piece of clothing isn't working for you, it's less likely that you will wear it, so why not give it a second life in someone else's closet? As January is coming to a close, I wonder how many of you created a list of New Year's Resolutions and, if so, have already failed to adhere to those resolutions? A couple of years ago, I read about Christine Kane's idea of picking a theme for the year instead of a making list of resolutions. She suggests that, by choosing a Word of the Year instead of making a long list of resolutions, we can be more focused and deliberate in our intentions and actions throughout the year. In 2009, my Word of the Year was "Courage," and I found many opportunities for courage to express itself. For example, I pursued genetic testing for the BRCA gene, a genetic defect found in many breast cancer patients like myself. Luckily, the outcome of the test was that I did not have the BRCA defect. Had the BRCA been present, I had resolved to pursue some pretty radical surgeries to decrease the likelihood of any cancer returning. Because I found the courage to take the test and face the results, I can now rest easier knowing that, with each passing year, my chances of long-term survival just keep growing. I also had to tap into my courage when, after completing my life coaching training in the summer of 2009, I began the development of a coaching practice for other cancer survivors. Prior to my coaching training, I would have hesitated in serving this population because of a previous fear that surrounding myself with cancer survivors may attract more cancer into my life. I have since faced that fear and moved beyond it. For me, courage and the overwhelming desire to bring joy into the lives of other survivors trumped any fears I had. Additionally, I faced a temporary fear of lack in 2009 when I firstsigned up for Christine Kane's Uplevel Your Business program. But once the program started and I began to learn valuable lessons in business development, I quickly realized that this investment in myself and my business would pay off and increase my prosperity. I enjoyed the experience so much that I have signed on for Christine's Uplevel Your Success program in 2010. This year, my Word of the Year is "inspiration". I hope to both inspire and be inspired throughout 2010. In my organizing business I want to inspire my clients to take bold steps in order to reclaim their space and time. I also aspire to set a good example by living my life with more focus and purpose. I hope this, in turn, will inspire both my organizing and life coaching clients to do the same. For 2010, Christine Kane has put together a great little free download called "Your Word of the Year Discovery Tool". Click on this link to see a video of her describing the value of the tool and the process. I invite you to download this tool and complete the exercises. Once you've decided upon your Word of the Year, I'd love to hear what you'll be focusing on improving in 2010! Remember when you were ten years old and the holidays were exciting and FUN? I loved the decorations, the smell of the Christmas tree in the house, the family feasts, and the possibility of getting of tons-o-toys. But as the years sped by, the holidays became less merry and more stressful . For several years, I even dreaded December a little because of the upheaval the season brought to my schedule, my bank account, and my waistline. 1. I stopped decorating the house if I wasn't in the mood or didn't have time to do it. This has resulted in me pulling out our cute little aluminum tree and retro decorations about every other year. Though he enjoys it when I decorate, my husband has ZERO interest in helping me decorate, so I only do it if and when the mood strikes me. I find I can just as easily be filled with the holiday spirit by enjoying everyone else's decorations. 2. My circle of fabulous girlfriends and I decided to stop buying one another Christmas gifts since we all live in relatively small houses, and we all have most everything we need. Instead, we just enjoy getting together at the Christmas party that one of the gals throws every year. This has saved all of us a boatload of money, time, and space. 3. Speaking of parties, I stopped saying yes to every single social invitation that comes up. 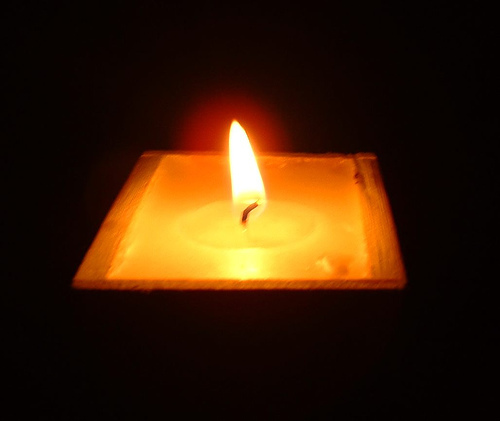 By protecting my personal/sweetie time during these weeks, I find that I'm more relaxed, centered, and rejuvenated. 4. I try REALLY hard to eat more veggies, drink more water, exercise more regularly, and only nibble on all of the yummy treats that pop up all season long. I'm never going to "just say no" to holiday goodies. But I do try to minimize the damage but nibbling instead of gobbling. I also have found that I feel a heck of a lot better if I limit my party libations to just one adult beverage. 5. I focus on the positive things in my life like my good health, my supportive family, my wonderful friends, my sweet little dog Ruby Pearl, and my growing businesses. I also start brainstorming, planning, and visualizing for prosperity in the following year. 6. I make sure I set aside some time and money to give back either in my neighborhood or by volunteering through my business. It's true that when we give, we truly receive. What have you done to de-stress this holiday season? We are only about a month away from Christmas which means it's time to get busy and develop your plan of action so that none of your holiday tasks slip through the cracks. I've put together a very detailed checklist that I am happy to forward to you. Email me at suellen@creativeorder.com for your copy. But to get you started, here are some ideas for gift-buying that'll have you hitting the ground running on Black Friday. Make a budget and gift list. First decide how much you want to spend. Then make your list of people to buy for, giving each a spending range. An excel spreadsheet is a great place to do this because you can move people around in spending ranges while still keeping an eye on the budget. To reduce potential household clutter, give consumable gifts such as tasty homemade goodies, a nice bottle of wine, or a gift certificate to a local restaurant. And for your friend with a green thumb, give houseplants or plants that can be transplanted into to the gardener's yard when the weather warms up. The greenest gift of all is the gift of your time, money and generosity to those in need. Instead of a huge family gift exchange, consider pooling your gift money and contributing to a charity such as www.heifer.org which provides impoverished people with animals such as goats, chickens, and cows that can produce ongoing food and income for the family. 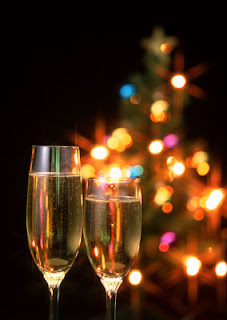 For my detailed holiday checklist that will keep you on track with your holiday to-dos, email me at suellen@creativeorder.com. The list includes everything from gift buying to setting the holiday table. There has recently been a spotlight directed on a dirty little secret hidden behind closed doors. With the popularity of the A&E television show "Hoarders" and The Oprah Winfrey Show's episodes on hoarding, the general public is seeing a phenomenon that professional organizers have long been familiar with: Compulsive Hoarding. 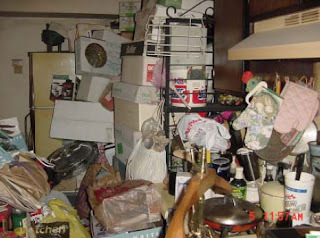 According to the Institute of Living, a mental health facility based in Connecticut that has a program specifically for hoarders, "compulsive hoarding is a common and potentially disabling problem, characterized by the accumulation of excessive clutter to the point that parts of one's home can no longer be used for their intended purpose." If you have seen some of the hoarding episodes I referenced above, that's putting it mildly. In many cases, the homes of hoarders have become so congested that the hoarders are at risk of losing their children, their pets and even being evicted from what sometimes becomes condemned property. Contrary to what some people assume, hoarders are not "lazy" or "just messy." The hoarding disorder affects up to 2 million people in the United States and is often accompanied by mental health issues such as ADD, ADHD, chronic disorganization, and obsessive-compulsive disorder to name a few. While my company, Creative Order, only takes on mild hoarding cases (find the NSGCD clutter hoarding scale here), I have seen almost all ends of the hoarding spectrum. In the more extreme hoarding cases, it is more appropriate for me to refer these clients to professional organizers who have had very specific training on hoarding and chronic disorganization from the National Study Group on Chronic Disorganization (NSGCD). National Association of Professional Organizers. www.napo.net. Find a professional organizer in your ZIP code range. Hoarders should be sure to check the Hoarding box under the Special Populations category when doing your search. Hartford Hospital's Institute of Living Anxiety Disorders Center. www.harthosp.org/InstituteOfLiving/. Find information about the mental disorders that are often associated with compulsive hoarding along with a quick online self-assessment. Buried in Treasures: Help for Compulsive Acquiring, Saving and Hoarding by David F. Tolin, PhD, Randy O. Frost, PhD. For lots more resources for hoarders, I invite you to go to professional organizer Geralin Thomas' site at http://metropolitanorganizing.com. Geralin has been featured on A&E's Hoarding show and has compiled an excellent hoarding resource list on her site. If you or one of your loved ones is a hoarder, please consider seeking professional organizing and mental health assistance before the situation becomes a health and safety issue. "I'd like to (fill in the blank), BUT...." You've heard it before. This is the way that most excuses begin. And many times those excuses have validity. But that doesn't change the fact that excuses are usually nothing more than our personal justification for not doing something that we don't want to do. I was recently talking to a potential organizing client who complained that (1) she came by her clutter honestly because one of her parents was a "pack rat" and (2) she often stayed at work until after 7:00 p.m. and was too tired when she got home to deal with the mountains of clutter that had accumulated over the years. The reason she called me was because she had finally had enough. She said that her home didn't feel like a sanctuary, clutter was taking over every room, and her personal relationships were being negatively impacted. This brave lady decided to stop making excuses and start taking inspired action. She is ready to turn off the EXCUSE-O-METER and let stuff go. We talked about donating things to people who really need them and throwing things away that have outlived their usefulness. She even talked about bringing in a cleaning company she got control of the clutter. Before we got off the phone together, I told her I can't wait to hug her neck for being so brave. I believe wonderful changes in her life will result from the actions that she and I are going to begin taking this weekend. What inspired action are you ready take to replace the excuses you've been making? There are a few stores that always make my eyes light up when I walk through them: the hardware store, The Container Store, Your DeKalb Farmers Market, and the office supply store. ESPECIALLY the office supply store. I'm pretty convinced that one of the main reasons I used to get so excited about school starting is because it meant that I'd get new pencils, notebooks, folders, erasers, calculators, etc. Wow, I'm giddy just remembering. But before I get you all hopped up on an Office Depot high, let's stop, take a breath, and plan a course of action. Here are a few tips for saving time and money while accumulating this school year's necessary supplies. Take inventory of what you already have at home. Look in last year's school bags, your home office desk drawer and any other areas where extra school supplies may have landed. You know that junk drawer in the kitchen? It probably has plenty of pens and pencils to get you started. How do I know this? I've organized a LOT of junk drawers in my time. Plus, I'm a recovering pen hoarder. Check out your local paper's circulars before shopping. Many stores will match the sales prices of other stores so pick the one with the lowest prices on your bigger ticket items and then see if they'll match their competitors' prices on the smaller stuff. Bring your list. Unlike me, try and maintain some degree of self-control when purchasing office supplies. Buy what's on the school's list of the basics and get the heck out of the store. If you need extra support, take someone with you who is immune to the intoxicating smell of new notebook paper. Buy throughout the year as sales come up. But be careful not to buy more than you have room to store. Occasionally, go through your backup inventory so you don't end up with duplication and lots of supplies that weren't needed. Use stickers to jazz up less expensive but functional notebooks and folders. If the kids insist on upgrading to the flashier versions, have them pay the difference to help them learn valuable lessons about money. Consider ordering supplies on line. 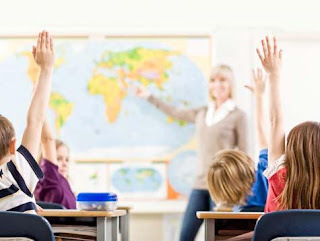 Schoolpak.com is a convenient and comprehensive site that caters to elementary through high school supplies. Teachers also swear by educationalwarehouse.com for learning tools, games, stickers, and even software. With a little planning and self-control, you can save a little while sending your student back to school armed with the tools to take on any class or project. I've always loved school. As a little girl, I would get giddy with anticipation at the thought of starting a new school year. Yeah, I know I'm a freak. * Before starting your back-to-school shopping, take stock of what's already in your student's closets and drawers. This is a great time to pull everything out of their closets to determine (1) what still fits, (2) what's not being worn because your kid doesn't really like the garment or it's uncomfortable and scratchy, and (3) what pieces are needed to fill in the gaps. * If the unwanted clothes are still in like-new condition, find a local consignment store and set up an account so that you can make a little money on your kid's castoffs. * When you're ready to start shopping, bring a list of the garments you're looking for to flesh out your student(s) closet. Just like at the grocery store, a list helps you save time, stay focused, and minimizes trendy impulse purchase. * Consider buying new clothes online as long as the seller has a flexible return policy. In my hometown of Atlanta, traffic is so crazy, it's worth it to buy stuff online just to avoid the stress and time of driving. Plus, you can avoid the crowds at the malls and discount stores during the back-to-school feeding frenzy. * Remember those consignment stores I mentioned earlier? They are a GREAT place to buy clothes for kids, tweens, and teens. A friend of mine has a teen who has just discovered that he can sell his old clothes and get some really cool gently-used clothes in the same store. This new discovery is saving his parents a ton compared to what they'd have to pay to new stuff to keep up with their fickle teen's ever-changing taste in fashion. Next time we'll discuss ways to save money and time getting school supplies. The old saying goes, "One person's junk is another person's treasure." While helping people reclaim their spare rooms (aka "junk rooms"), basements, and garages, my clients and I come across lots of items that are no longer serving them that could be resold for some cold, hard cash. Here's another news clip where I discuss a free local classifieds site I've partnered with that's perfect for de-cluttering your home or office. The site is kijiji.com (http://atlanta.kijiji.com in the Atlanta market), and it's owned by the international auction site, www.ebay.com. Unlike ebays auctions, however, transactions are handled locally between the buyer and seller. The seller posts the item on kijiji's user-friendly site for a set price (no bidding necessary), and then meets the buyer locally to exchange the goods for cash or check. Plus the buyer gets to touch and see the item before they buy. And because it's the responsibility of the buyer to transport the item home, it's easy for sellers to get rid of larger items like furniture and even cars. If your goal is to make a little money while getting clutter out of your home or garage, see if kijiji.com has made it into your market. Planning and proper preparation can make all the difference in the success of a project. Admittedly, I can get caught in the trap of over-planning (some may call that procrastination). But I'd like to share an example where I embarked on a project without doing enough preparation and paid a price for it. About ten years ago, I discovered a love of gardening and began landscaping my backyard. Because it was so shady back there, the lawn was nothing more than a big patch of red clay with an occasional grass sprig or weed. To cover up some of the bare spots, I created mulch paths surrounded by shrubs and plant beds. After digging up many wheelbarrows of dirt and laying down almost as many loads of pine bark, the paths were done....or so I thought. What I failed to do back then was lay down a weed barrier or edging. Over the years this oversight has led to many hours of weeding the paths, pulling up grass that encroached into my neatly laid lines (after losing some trees, the grass magically began growing), and trying to control the path mulch from washing into the yard when it rained. Fast forward ten year later and I'm finally investing some sweat equity and planning into fixing my former mistakes. After waiting until the most recent batch of old mulch had broken down. I weeded the paths AGAIN, installed new path edging, laid weed fabric, and filled the paths back up with countless loads of mulch that I had left over from a tree removal. Now I can rest assured that I won't be weeding or re-mulching my paths for the next couple of seasons. And to simplify my yard maintenance even further, when THIS batch of mulch eventually disintegrates, I'm investing in rubber mulch made from ground up recycled tires. That stuff won't need to be replaced for years. By doing the prep work that I should have done a decade ago, I'll be saving myself hours of back breaking weeding. Now if I can just figure out a way to keep those oak trees from shedding so many leaves in the fall. What type of prep work do you do to make your gardening projects more efficient long term? I am excited to announce that I have recently partnered with Kijiji.com, the free local classified web site, to promote their Baby On Board campaign where we're helping expectant parents get their homes organized in anticipation of their new baby. Kijiji, which means "village" in Swahili, is a family friendly , safe, and easy to use classified site that does not contain explicit adult content as some other classified sites do. This makes Kijiji.com a great site for expectant parents to use to buy and sell items as they stock up on baby gear. Go to http://atlanta.kijiji.com and at the top of the page you'll find the link to my tips for making room for baby while saving money. To transform a home office or spare bedroom into a new baby's room, it is necessary to first purge the old furniture from the space. Kijiji.com is an easy solution for this as it only takes a few clicks to create an ad for that old desk, computer, or spare bedroom set. Selling unused furniture, electronics, and appliances from the home is a great way to offset the average $2,500 that new parents spend on baby-related items. To furnish the baby's room, consider buying gently used baby items on kijiji.com. According to eBay market data as reported by ItsDeductible, a used crib averages $37 and a rocker or glider averages just $41! That's a substantial savings from what new parents would pay retail. Rather than purchase a new changing table, convert an gently-used or antique wooden dresser to a changing table by adding a changing pad to the top. They average for around $31 on Atlanta.kijiji.com. Paint the dresser to match the baby's room, update the hardware and drawer liners and you'll have a great piece that can be re-purposed in the child's room as they grow older. Keep a tall bookshelf near the changing table as another storage option. You can place memorabilia on the upper shelves, extra clothing and bedding on the lower shelves, and use the easy-to-reach middle shelves for necessary changing supplies. To maximize storage options, don't forget about all that space under the baby's crib! Plastic drawers and under-bed storage boxes are great solutions for clothing that the baby has not yet grown into. Tune in on Monday for even more tips for getting ready for that little ray of sunshine! I believe that it's a good idea to occasionally do something new in a space just to enliven its energy. Maybe paint a room a new color, add a new piece of furniture, or rearrange the furnishings already there. Today I jazzed up my home office space by adding elfa shelving over my desk. The photo posted was taken just after I put everything back in place. Let's take a tour of the new workspace. * On the very top shelf, I keep items that I sometimes reference but rarely need. These include colored hanging file folders, CDs from classes I've taken, and transcripts from a Success Circle Mastermind that I recently belonged to. Rather than give these items the valuable real estate that is reachable from my desk chair, I've put them up on the top shelf. I keep a stepladder close by to help me reach these items when necessary. * On the next shelf down we have items that I use a little more often such as copy paper, writing tablets, thank you cards, manila folders, labels, and sheet protectors. These are easily reachable just by standing up from my desk chair. * Further down and closer to the desk top is my reference material such as organizing and coaching books, notebooks from annual NAPO conferences, my binders from my Coach for Life training, and the notebook where I keep resource material for a book I'm planning to write. * Moving down closer to the desk top, we're getting into pricier real estate. In order to live on the shelf right about the desk, an item has to be something that I use all the time. This is where I keep my dictionary and thesaurus, tissues, desk lamp, and a 3-tiered paper sorter. Speaking of my 3-tiered paper sorter, I use the middle shelf of the paper sorter for papers that need to be filed. Once the pile reaches the top shelf of the paper sorter, that's my visual alert that it's time for me to do some personal filing. The other shelves on this paper sorter include ACTION at the top (high-priority projects I'm in the middle of right now) and PROJECTS on the bottom for things I plan on working on in the future. * Finally, we have the desk top. I use a laptop computer for its portability. To keep it from overheating, I have it sitting on a plastic stand that was originally meant to be an under-cabinet glass holder. The pile of papers to the right of the computer is my ACTION pile for the day. On the far left corner of the desk is a tray that holds the little things one might have in desk drawer, only I don't have a desk drawer. So I have my sticky notes, stapler, paperclips, etc. in this tray. The tray was once the lid to the striped box on the very top shelf over the desk. I love to repurpose items! Next to the office supply tray on a separate but flush shelf is a staggered file holder. In this, I keep those files and reference materials that I access ALL the time as my assessment forms, my Waiting For file, my Someday/Maybe file, and my current year's tax file. So you see, I keep my desktop relatively open because it helps my creativity when I can spread my work out a bit and am not too distracted by visual clutter. Close by, I keep those items that I use quite often. And a little further away, I store supplies that I need but don't want junking up my work space. And the best part is that it only took me about 30 mintues to install the elfa and restock the whole thing! I *heart* the ease of installation, flexibility, and durability of elfa shelving. My husband is also pretty excited to have inherited the Skandia hutch I was using before today. What do you use to store items in your home office? Look for me in the April 27th Atlanta edition of Daily Candy Kids where I discuss ways to tame kids toys and artwork. With overzealous grandparents and well-meaning aunts and uncles, toys just seem to multiply overnight. On Daily Candy Kids, I offer tips for using overlooked spaces such as the backs of doors and underneath beds to stow toys and children's artwork. Here's a bonus tip just for my Better Organized blog readers: You can place stackable drawers side by side under many children's beds. They make great containers for tiny little parts and pieces, doll clothes, and Legos. Plus the drawers can be pulled completely out in case the toys need to be played with in another part of the house. Measure the space from the floor to the bedframe and head out to The Container Store, Target, Big Lots, or even The Dollar Store for the plastic stackable drawers. Or if you're looking for a bed with built-in drawers, check out IKEA's selection. The City of Decatur announced the cancellation and rescheduling of the March 28, 2009 Electronics Recycling Day due to heavy rains and lightening over the weekend. Because the event is held outdoors , the severe weather made it a safety hazard for the workers and volunteers. Electronics Recycling Day has been rescheduled for Saturday, April 25 from 9:00 a.m. - 1 p.m. in the Decatur High School parking lot. Visit www.decaturga.com for a complete list of electronic items that may be recycled and for more details about the event. You may also call (404) 377-5571 for information.